SNP Poland proprietary solution – SNP EasyInput – enables to run business transactions in SAP system (ERP, CRM, SRM, BW,…) based on the data gathered in MS Excel workbook. It accelerates the user’s work and increases productivity. The data are processed with a user-friendly MS Excel interface, which significantly improves work and reduces the possibility of errors when transferring information. SNP EasyInput provides both a simple (one-step) possibility of export of even the most complex data from MS Excel files to SAP systems as well as the possibility of importing data from SAP to MS Excel workbooks. What makes the product unique is the comprehensiveness of the support of SAP – Excel integration process. SNP EasyInput provides ready, empty forms for entering and reading the data; generates descriptions and control information for a user as well as prompts concerning possible values that are manually entered in the fields. SNP EasyInput also includes possibility to run in a test mode, user-friendly handling of error messages or protection against the loss of processed data. All of this functions within an intuitive interface that is integrated with MS Excel, with the multi-language support and with the user’s manual available. SNP EasyInput configuration for a specific application can be done by business users themselves without the support of consultants. The solution is an out of the box product. It can be used immediately after its installation on a user computer. To see more presentations and courses dedicated to SNP EasyInput, go to the forum. 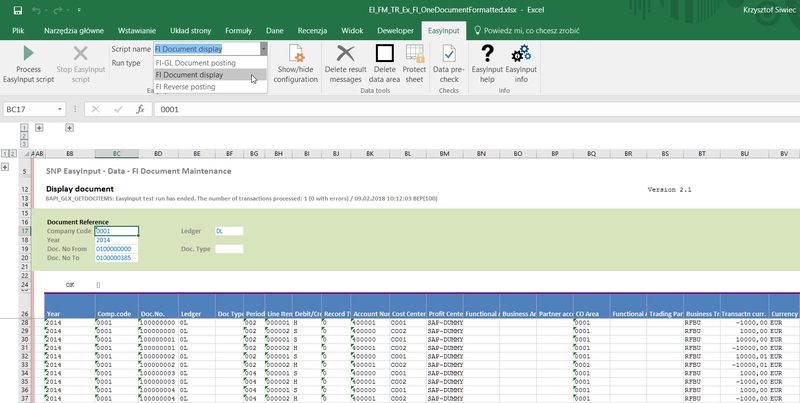 SNP EasyInput provides both a simple (one-step) possibility of exporting even most complex data from MS Excel files to SAP systems, as well as the possibility of importing data from SAP into MS Excel workbooks. What makes the product unique is the comprehensiveness of the support of SAP - Excel integration process. 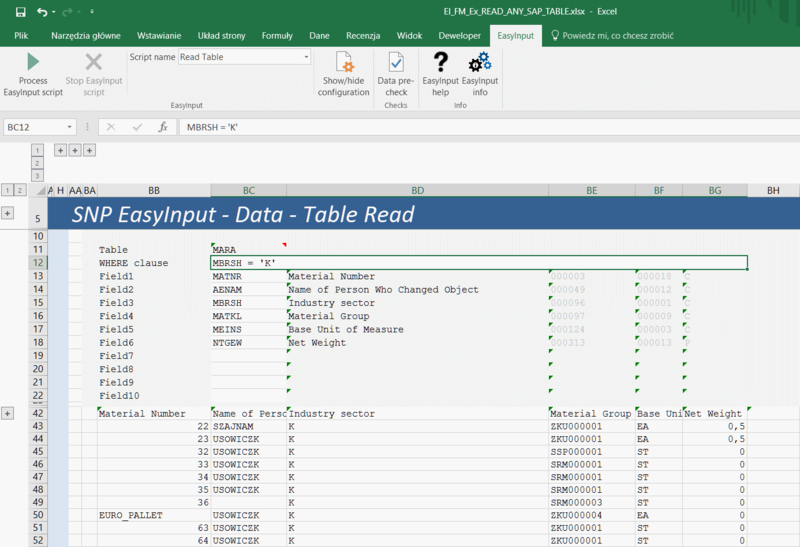 SNP EasyInput integrates with MS Excel and adds additional ribbon menu. 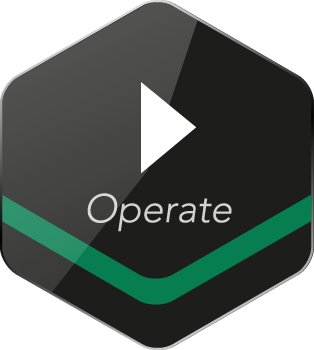 This contextual menu provides the user with easy access to all product functions. The distinction between running EasyInput in test or actual modes allows the user to well check the data, before actually changing anything in the SAP system. As opposed to SAP LSMW, error/success messages in EasyInput are well linked to transfered data. Thus, finding wrong data line and processing only erroneus records is really streightforward. The SAP search help (F4) functionality is embedded in SNP EasyInput Excel workbooks. 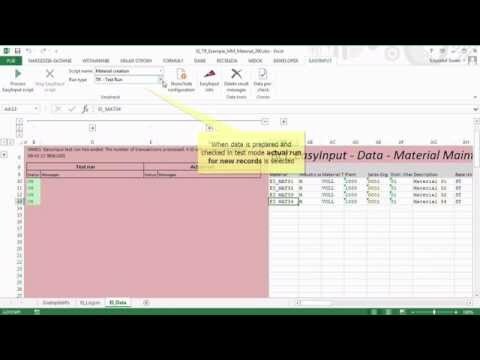 This facilitates data entry and limits the number of user errors when preparing data for migration in MS Excel. SNP EasyInput workbooks can be formatted in order to be more user friendly. This is especially usefull when one uses SNP EasyInput instead of SAP GUI to process transactions. Several custom formatted EasyInput example documents are part of SNP EasyInput installation package. The layout for posting an FI document is a good example here. 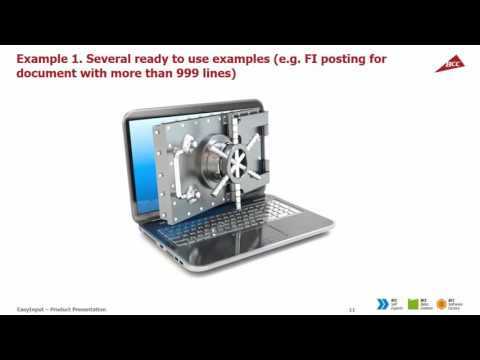 An example allowing posting FI documents larger than 999 lines is also provided. SNP EasyInput workbooks can contain more than one EasyInput script. This can make using SNP EasyInput even more comfortable. Both uploading data to SAP as well as reading data from the SAP system is possible. Below one can see example of SNP EasyInput workbook hosting three scripts. 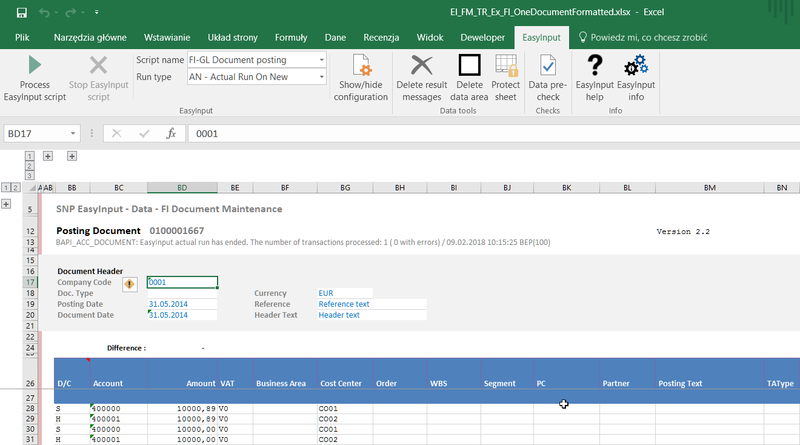 One of them allows to display financial documents within Excel. Thanks to SNP EasyInput API it is easy to mix ESNP asyInput scripts with Visual Basic for Applications (VBA) macros. This can help in building complex scripts that should process data between sending to/ retrieving from the SAP system. Together with the installation pack the user receives examples of such scripts. SNP EasyInput can read data from virtually any SAP table or database view. This can be usefull when one needs to retrieve especially custom data from the SAP system. Of course the user retrieving SAP data has to have sufficient authorizations in the SAP system. By creating custom function modules one can extend standard SNP EasyInput functionality. 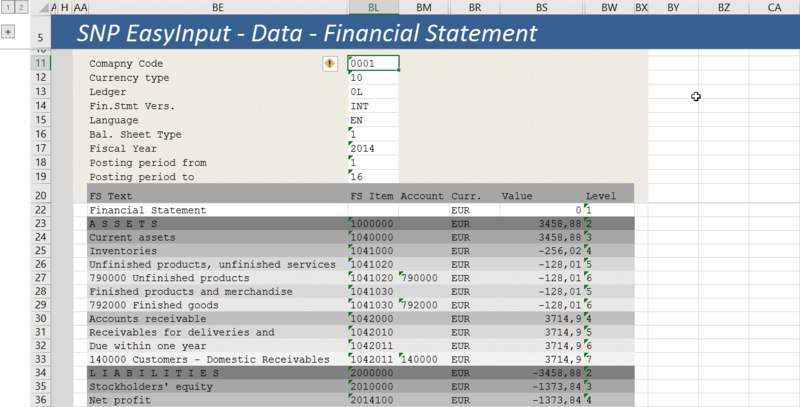 An example here is an extension developed by SNP Poland to report financial statement in MS Excel. New improved version has come!